More electricity needs to move between provinces, and a clean power fund could get it done, creating a competitive advantage in the low-carbon future. Canada’s economic success increasingly depends on access to abundant, clean, reliable electricity delivered at the lowest and most sustainable price. Electricity provides a tremendous potential competitive advantage in a world focused on carbon reduction. Think electric vehicles as one example. However, certain historical patterns and recent developments in how we create and distribute electricity in Canada stand in the way of achieving this goal. Canada has abundant capacity to create and distribute electricity, but our electricity story is one of feast coexisting with famine: a patchwork of systems improvised over time with highly disparate outcomes. Provinces have each attempted to be self-sufficient, creating haves and have-nots in the electricity system. There is little interprovincial trade to take advantage of strengths and weaknesses, and no national strategy in this area of provincial jurisdiction. The result is that have-not provinces depend on high-polluting and high-cost solutions (including remediation and decommissioning) to meet their energy needs. The have provinces have avoided these costs but are pursuing the short- to medium-term financial benefits of selling excess power to the American market. This diverts power from the domestic market and builds yet more economic dependence on the United States, a significant long-term cost for Canada, as demonstrated in the recent NAFTA renegotiation. Canada is a world leader in clean electricity, with two-thirds of production coming from renewables and roughly 80 percent from emissions-free sources of one type or another. About 11 percent is exported to the US over 34 major intercontinental transmission lines, according to Natural Resources Canada. Some of this could be used domestically to attract investment to energy-intensive industries. Newfoundland and Labrador has it and the Maritimes need it. With continued advances in the efficiency of electricity transmission, this provides a strong base from which to operate. To address these issues, Canada’s clean energy surpluses should be diverted to the domestic Canadian market. And a unified national grid should be woven together to pool access. To that end, the government of Canada should provide capital for a clean power fund, perhaps as an offshoot of the Canada Infrastructure Bank. Any such fund should be given a broad mandate to knit together Canada’s clean power grid where it finds willing provincial partners or open, regulated markets in which it can participate. In its interventions in the electrical grid, the federal government has focused on the poverty of the east-west grid and the need for much greater transmission capacity between Canadian jurisdictions. These initiatives have been politely received, in part because free federal money is always welcome. But no province is contemplating a move away from provincial self-sufficiency. Here are some of the arguments often put forward by government officials and industry experts for maintaining provincial self-sufficiency. Economic development: Provincial governments want to keep economic stimulus and job creation opportunities in-province. The large construction and capital budgets for major power development can be used as countercyclical economic development tools and to generate politically popular job creation. Buy-local and community-benefits policies can also be used to spread the economic benefits of development more widely through the provincial economy. Capital retention: Provincial self-sufficiency means that gross billings for electricity remain in the provincial economy; and in provinces with public power systems, net profits go to the provincial treasury. A pooled system with no federal role would tilt gross and net revenue to the have provinces — a very large transfer of wealth and economic opportunity. Defending incumbents and invested capital: All provinces have incumbent power providers, which have placed 20- to 100-year bets on the stability and predictability of the regulatory regime and the competitive environment in each province. A shakeup in Canada’s electricity system, in particular the large-scale entry of BC Hydro, Manitoba Hydro, Hydro-Québec and a newly powerful Newfoundland and Labrador power company into other provincial power markets, could potentially strand capital in uncompetitive incumbent power plants while resulting in the downgrading of debt and a flight of equity capital. Many incumbent power plants and generators might not survive the experience, leading to a greater concentration of the industry. Trust: As a good deal of public opinion research demonstrates, Canadians generally prefer publicly owned power utilities because they believe that, given a choice between the public interest and narrow financial interest, publicly owned utilities will put citizens first. Provincially owned or regulated power utilities, however, owe this “duty of public interest” only to citizens in their own jurisdictions. Provinces do not feel a duty of public interest to each other. For all these reasons — economic development, capital retention, incumbents and trust — it is unlikely that, without the introduction of a strong incentive, Canada’s provincial governments will collaborate to create a pooled national grid any time soon. Progress could be made by introducing a new player — a national player — with a public interest mandate sensitive to the economic and fiscal pressures at play, and prepared to partner with incumbents to give them an opportunity to evolve into useful components of a more integrated national system. The new national player could enter into a more positive relationship with provincial actors than provinces often have with each other. Enter the new fund. Let’s call it the Canada Clean Power Fund. The federal government should consider authoring the establishment of a publicly owned national fund with a mandate to partner with willing counterparts to address Canada’s electricity famines by drawing on nearby feasts. If well-capitalized and aggressively led, such a fund could focus on three contributions with the objective of knitting together a clean national electricity grid. Transmission: A Canada Clean Power Fund could capitalize and drive the construction of a robust east-west power grid, and then either operate it in the public interest or spin it off to one or more private operators that are regulated. Transmission investments should be twinned with a careful review of Canada’s national interest in any further expansion of north-south interties, which are the interconnections permitting the passage of current between electric utilities. 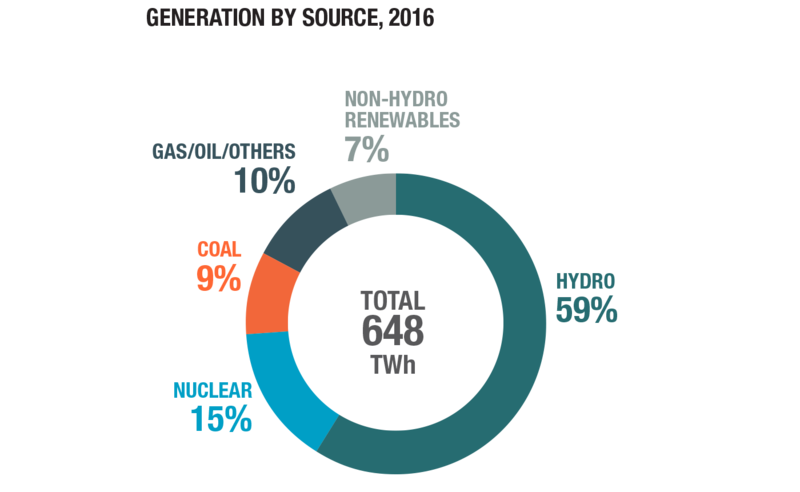 Surplus diversion and domestic pooling: A Canada Clean Power Fund could provide have provinces with an alternative market to the United States by reselling electricity to have-not provinces, with appropriate revenue recycling arrangements to mitigate the wealth transfer issues discussed above. New clean capacity: In regulated markets open to new entrants, a Canada Clean Power Fund could partner with incumbents or other players to provide capital for renewable and clean generation where appropriate. In all these initiatives, the fund would need willing provincial partners, since the electricity system is run and governed provincially. There are risks that would need to be managed, and trust to be built, perhaps aided by governance structure. Some will argue that such a direct intervention into the electricity system would be an overreach in this era of diminished expectations for government. The federal-provincial issues would not be small: the blander and more technical a launch, the better to avoid political attention. But this proposal at least highlights the serious issues Canada’s electricity system faces — issues that go well beyond technical access to east-west connections. They merit a careful strategic review. Electricity is the string that ties together the pearls of Canada’s future clean power and digital economy. This article is adapted from Canada Next: 12 Ways to Get Ahead of Disruption, a Public Policy Forum series of 12 papers on disruptive challenges and opportunities facing Canada.